The being that was to be Bhagavan Arishtanemi, in his earlier incarnation, was Shankh, the eldest son of king Shrishen of Hastinapur. One day some citizens and wayfarers came to the king and informed him that the highways approaching Hastinapur and the surrounding area were being terrorized by bandits and smugglers. No traveler or villager was safe from the attack of the bandits. Robbery and murder became a daily routine for them. The citizens requested he king to protect the masses. the king deputized prince Shankh to go and punish the bandits. Prince Shankh was an accomplished diplomat and strategist. He planned and conducted his campaign in such a way that he apprehended the leader of bandits without any bloodshed. While he was on his way back he heard the cry of help of a young princess abducted by a Vidyadhar (a lower god); prince Shankh challenged the Vidyadhar, defeated him and saved princess Yahomati. when these young people saw each other they fell in love and got married. In due course prince Shankh ascended the throne. Knowing all this Shankh had a deep feeling of detachment. He gave his kingdom to his son and became an ascetic. 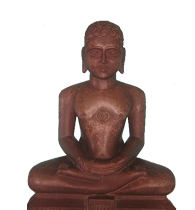 As a result of high spiritual practices and deep devotion for Jnan he earned the Tirthankar-nam-and gotra-karma and reincarnated in the Aprajit dimension of gods. The being that was Shankh descended from the Aparajit dimension of gods into the womb of queen Shiva Devi, wife of king Samudravijay of Sauripur. The fourteen great dreams indicated that this being was to become a Tirthankar. On the fifth day of the bright half of the month of Shravaan queen Shiva Devi gave birth to a son. As per the convention 56 goddesses of directions arrived and performed the birth celebrations after the post-birth cleaning. During the naming ceremony the king conveyed that as the queen had seen a disc with Arishta gems, the new born will be called Arishtanemi. Arhat Neminath spent fifty four days in deep spiritual practices and then went to Vijaynat hill (Girnar). On the fifteenth day of the dark half of the month of Ashvin, in he afternoon, he was observing a two days fast and was meditating under a bamboo tree when he became an omniscient. Establishing he four pronged religious organization (Tirth) he became the twenty second Tirthankar.